Who needs Spring time as an excuse to clean? 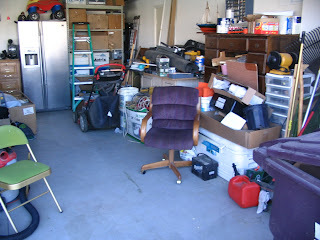 Not me, and since I had the help of my mom, I was able to get a little bit more done around the house. I have had a burst of some renewed energy lately, but don't quite have the stamina or the muscles at this point to do EVERYTHING that I want to do. 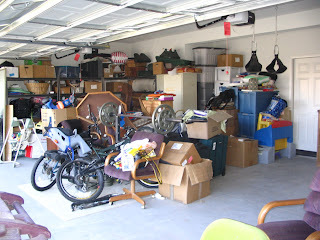 I did take on the task of cleaning the garage, as I was sick and tired of having to try and maneuver through the mess to get to the other side. I pretty much left Dave's tools alone. That is a project for another day. 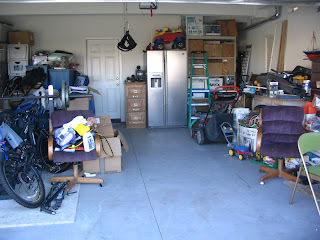 Although I don't know where Dave wants all his tools, at least I stacked them on the right side of the garage. I started taking pictures halfway through. You should have seen it from the beginning. You'd think that we didn't make much progress, but in actuality we did. All of the furniture in the middle, I didn't touch. I can't, or should I say, I shouldn't be lifting it right now. Not to mention we need to sell all of it anyway. It's not stuff we are planning on keeping. 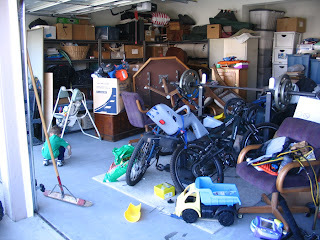 I did find a space for the bikes, parking place for Caiden's beloved jeep (the only vehicle we plan to park in the garage) as well as a "viewing" area for me to sit while Caiden plays with the neighborhood kids. I get tired of standing, and that was BEFORE I was pregnant. How cute is his helmet? It didn't take us very long. 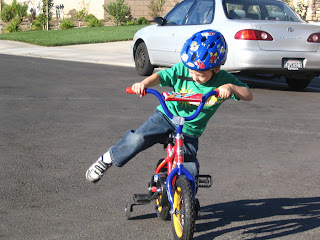 We did it prior to going to Home Depot, and Caiden even had time to show Gigi how well he could pedal his bike. 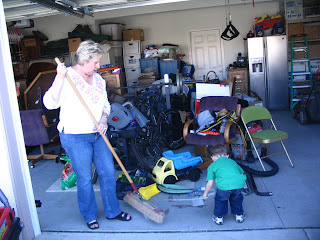 Funny, Jeff and I cleaned our garage yesterday. I love how good it feels to get cleaning done. That is a very nice path you've made.